The Sholazar Basin is home to a lot of really horrible things. If you're going to visit, wear bug spray. And plate armor. I suppose Un'Goro will have a lot more of such guys, whenever such stuff happens Blizzard introduces keyword. "But he trades for basically everything!" is what you will hear of this guy. But take note: weapons aside: this guy will always trade for a card. Be it removal or a minion. There is great value in this. He is a good tool for grinding cards out of your opponent. And god forbid if you get to enhance him with a buff. 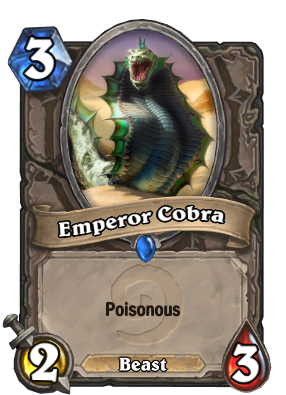 He's great in arena, he's fine in constructed assuming you know what you are doing. In a priest he can benefit from Velen's Chosen or the shadow word: shield and heals. He is a beast, so hunter could consider him if they want a slower game with Tundra Rhino and Beastmasters. You could play him in warrior, if your selection of removal spells is still not extensive enough. He can get charge in that deck as well. Value with Tundra Rhino as a 3-mana kill card. Never seen this happen, but I hear if Rogue uses Betrayal on him his effect triggers on both neighbors. Be careful where you place him in that matchup. Not quite as prevalent in the post-Naxx world due to the abundance of deathrattles.